In September we celebrate National Grandparents Day—a day to cherish your beloved grandmother or grandfather by spending quality time with them as a family. Any gesture or shared activity, no matter how simple, is a way to honor your parent or grandparent. We have come up with four easy activities to do together if your grandparent lives in an assisted living community. These ideas take only a few supplies and can be shared no matter your age! Share a book. Find a popular children’s book, appropriate for the age of your child, to keep at their grandparent’s apartment. Share a chapter together from this book each time they visit. This will give both your child and parent something to look forward to when they are together. 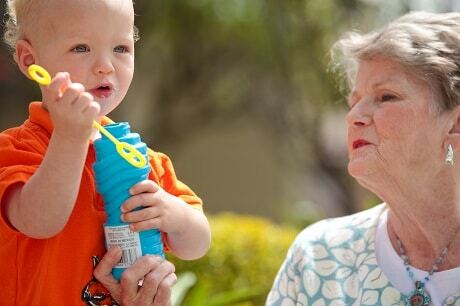 If your child is learning to read, have them bring a book to read to their grandparent to show off their new skill. Stories are a wonderful way to transcend generations. And many seniors may love hearing classic stories, such as Charlotte’s Web or the Beatrix Potter series, that they may have once read to you as a child! Audiobooks. If your parent’s vision is poor or they are no longer reading, consider downloading an audiobook to share with their grandchild. These audiobooks can be saved and shared a chapter at a time during each visit. Headphones can also benefit seniors who have difficulty hearing. Podcasts. For older grandchildren, a great form of storytelling to share is a podcast. Podcasts are produced on a range of topics and interests. Research a topic that both your parent and child would love to listen to together. The History Chicks or Hidden Brain can be educational and entertaining, if they share a love of history or science. The StoryCorpsor The Memory Palace podcasts can encourage seniors to share their own stories. Keep in mind, some podcasts can have mature content so click here for more podcast suggestions with descriptions for age appropriateness. Coloring Books. A popular trend with adults is to indulge their creativity in adult coloring books with intricate designs and contemporary themes. This is a great activity to share with children of any age. It allows them time to chat and catch up while showing off their artistic side. If your parent has issues with arthritis, we suggest using wide barrel pens that are more comfortable to grip. At Aegis Living, we celebrate all Grandparents and hope you take the time to visit with yours today.